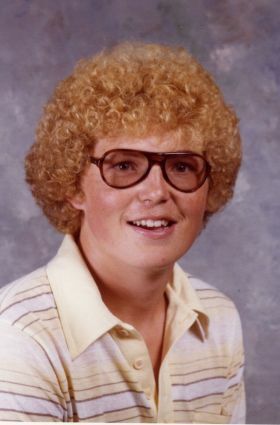 Some people are embarassed by pictures of what they looked like in high school. Although I was style-challenged, I actually like what I looked like in school. I suppose my proudest moment in school was when I grew a ‘fro. It was the summer of ’79 and I was on staff at Boy Scout Camp. I needed hair style that was easy to care for. My friend’s Mom cut my hair short and gave me a real tight perm. All summer, it was short and tight. When school finally started, the perm, combined with my natural curley hair, stayed and as my hair got longer, the ‘fro started to take shape! I was proud of that hair. Growing up, one of the coolest guys I knew (His name was Garth. He drove a 280Z and we used to drive 100 miles to take guitar lessons.) wore a ‘fro so I thought I was pretty cool. Most people laugh now, but I still think it was pretty special. That is one thing I want to pass on to my kids. That no matter what other people think of you, the only person you need to impress is you. « Happy 230th Birthday Marines! Never thought this was awkward. It was hip – in its day!